I have decided to host my very first Blog Giveaway! I will be giving away two 60ml bottles of Nielson Massey extract, at the flavour of your choice. Flavours include coffee, lemon and vanilla. 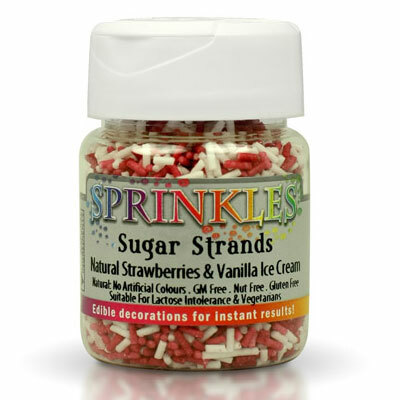 The giveaway also includes some cute Strawberry & Vanilla Sugar Strands. And that's it! I will pick the winner at random on 28th April, entries must be made from the UK only! I'm now following you via Google Friend Connect :) you have a lovely blog! I will be keeping my eye out for your future posts! Good luck with the give-away, I'll be doing my first give-away soon too! Good luck everyone. Had no idea they did anything other than vanilla - am off to investigate what now. I'm entered and am now following you via Google Friend Connect. I'm now following with GFC. Good luck with your first giveaway. Same... I never buy alcohol really as most of the money goes into the food - unless it's for a stew or something! 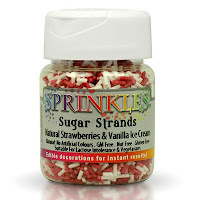 Those sprinkles are gorgeous, they would make a welcome addition to my baking cupboard! I am following you with pleasure via GFC. You have a lovely blog with wonderful recipes. I use this vanilla extract all the time in my cakes. It is one of best around! I've just seen your blog and love it, will definitely be reading more and can't wait for all the upcoming posts!